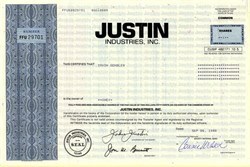 Beautiful certificate from the Justin Industries, Inc issued in 1994. This historic document was printed by American Banknote Company and has an ornate border around it with a vignette of the company logo. This item has the signatures of the Company's President and Secretary and is over 14 years old. Justin Industries, Inc. combines two very disparate businesses--boots and building materials form a uniquely successful corporation. While outsiders struggle to perceive the synergies between boots and bricks, Chairman and Chief Executive Officer John Justin Jr. drew parallels between them in a 1981 interview with Forbes reporter Anne Bagamery: "Why, just take a look at them. They're both made of natural materials and they both protect you--that puts them practically in the same family." Dan McGraw of U.S. News & World Report averred that wily CEO's "very name is an icon of Western heritage," while analyst David Leibowitz called his company "a perennial standout and the quintessential Lone Star firm." Over the course of his more than 45 years at the helm, the CEO--an octogenarian in 1997--increased annual sales from less than $1 million to nearly $450 million. BERKSHIRE HATHAWAY INC. SUBSIDIARY SUCCESSFULLY COMPLETES CASH TENDER OFFER FOR SHARES OF JUSTIN INDUSTRIES, INC.
Omaha, Nebraska and Fort Worth, Texas, July 26, 2000 � Berkshire Hathaway Inc. (NYSE: BRK.A, BRK.B) and Justin Industries, Inc. (Nasdaq: JSTN) announced today successful completion of the cash tender offer by a subsidiary of Berkshire Hathaway for all outstanding shares of common stock of Justin. The tender offer expired, as scheduled, at 12:00 midnight, Eastern standard time, on Tuesday, July 25, 2000. Berkshire Hathaway, through its wholly owned subsidiary making the offer, has accepted for purchase all shares validly tendered and not withdrawn prior to the expiration of the offer. Based on information provided by The Bank of New York, as paying agent, approximately 24.7 million shares of Justin have been acquired by Berkshire Hathaway�s subsidiary out of the approximately 25.8 million shares currently outstanding, or approximately 95.6 % of all outstanding shares. Payment for shares properly tendered and accepted will be made as promptly as practicable and, in the case of shares tendered by guaranteed delivery procedures, promptly after timely delivery of shares and required documentation. As previously announced, Berkshire Hathaway will acquire the remaining Justin Industries shares in a merger in which each share of Justin common stock will be converted into the right to receive $22.00 in cash and following which Justin will become a wholly owned subsidiary of Berkshire Hathaway. Berkshire Hathaway and Justin expect to consummate the merger as soon as practicable. Justin Industries includes Acme Building Brands - Acme Brick Company, the leading domestically owned United States manufacturer of face brick; Featherlite Building Products Corporation, the leading Southwest producer of concrete masonry products; and American Tile Supply Company, a major Texas distributor of ceramic and marble floor and wall tile, and Justin Brands - Justin Boot Company�, Nocona Boot Company�, Tony Lama Company�, and Chippewa Shoe Company�. Berkshire Hathaway is a holding company owning subsidiaries engaged in a number of diverse business activities. The most important of these is the property and casualty insurance business conducted on both a direct and reinsurance basis through a number of subsidiaries.